Martin is creator/director of the jazz and contemporary program at the Joffrey Ballet School and artistic director of Dorrell Martin LEON Contemporary Dance Group/NY formerly known as Dorrell Martin Dance Fusion. Martin was soloist for the national and international touring company "A Few Good Men Dancin" and has danced in shows such as Aida, West Side Story, Lion King and Swing. Martin has also performed with companies such as Arch Dance, Locke Contemporary Dance, Metropolitan Opera and Richard Riveraâ€™s PHYSUAL just to name a few. He has performed in performance venues such as Jacob's Pillow Dance Festival, Joyce SoHo, Blaktino at BAAD in the Bronx, Riverside Theatre and American Dance Festival with some of New York's emerging choreographers. He has performed with recording artists such as Jennifer Lopez, Pink, Emma Bunton, Black Eyed Peas, Rihanna and Debra Cox. A native Houston, He is former artistic director of Houston Metropolitan Dance Company. He received Honorable Mention for choreography at the World Jazz Congress in Washington D.C. 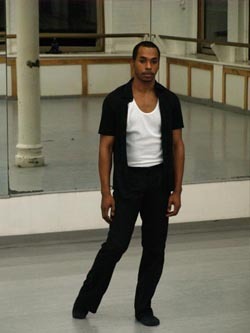 In 2003, he founded Dorrell Martin Dance Fusion in Houston, TX. The company made its international debut performance in Veracruz, Mexico at the Festival Danza Cordoba. His dance training includes the Paul Taylor School, Feld Ballet, Houston Ballet, The Alvin Ailey American Dance Center, EDGE Performing Arts Center in Los Angeles, New York State Summer Intensive with the New York City Ballet and throughout Europe. Working with notable choreographers such as Sean Curran, Daniel Ezralow, Kevin Wynn, Liz Imperio, Pattie Obey, Margo Sappington and Mat Eks among others, Martin has taken the experience of working with such great artists to explore and find his own voice in movement. Teacher, choreographer and director, Martin teaches jazz dance and contemporary dance thought-out the country and has set works on many dance companies and schools.